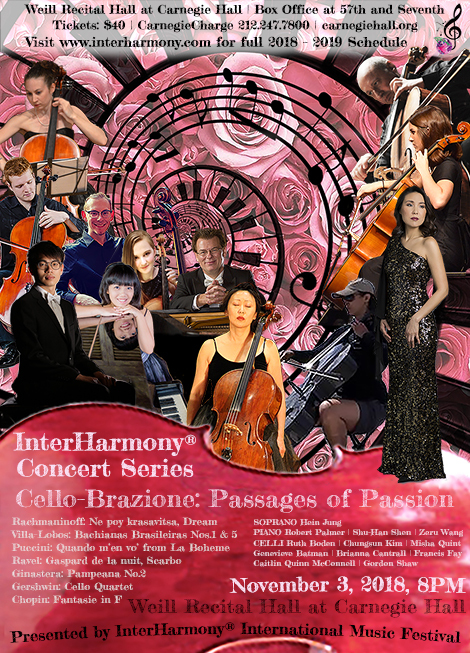 Like passages of running musical notes trying to reach desirable chords of emotions, the presentation of the InterHarmony Concert Series’ Cello-Brazione: Passages of Passion will give the audience a chance to find a special warm touch of sound lingering for days after the concert on November 3, 2018 at 8PM at the Weill Recital Hall at Carnegie Hall. Music Director Misha Quint started the InterHarmony Concert Series six years ago, showcasing the best and brightest international artists and young musicians who performed at the InterHarmony International Music Festival in Italy and Germany. Tickets are $40 and can be purchased by calling CarnegieCharge at 212.247.7800, at www.carnegiehall.com, or at the box office on 57th and 7th Ave. The program will commence with young artist Shu-Han Shen performing Ravel's Gaspard de la Nuit, III.Scarbo, setting the energy level that will be persistent and even intensified as the concert progresses. Ravel was inspired by the poetic story describing the duplicitous nature of art by Bertrand entitled Fantasies in the manner of Rembrandt and Callot. The movement Scarbo portrays a goblin flitting about a darkened room, casting shadows in the moonlight. One cannot ponder about passion without Ginastera's Pampeana No.2 to be performed by virtuosic cellist Chungsun Kim and pianist Zeru Wang. In Pampanea, the cello will sing, scream, and crash. Pampeana quotes folk songs from Ginastera’s native Argentina with hints of the malambo dance, evoking images of the pampa flatlands. Pianist Robert Palmer whose illustrious solo career conquered the hearts of global audiences will perform Chopin's virtuosic Fantasie in f minor with its cascading harmonies intertwined into chords and limitless passages that could finish any concert, yet will only mark the end of the first half of the passionate passages prepared for the evening. 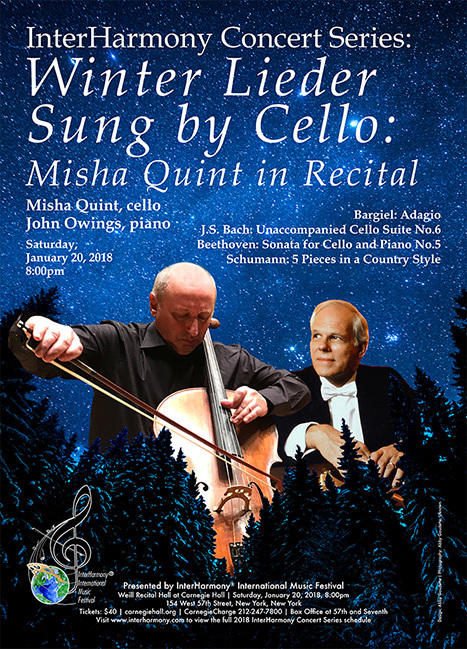 Soprano Hein Jung, acclaimed by the Boston Globe for her “superior vocal value”, together with pianist Zeru Wang will present not only the beauty of the most famous arias, such as Puccini's Quando m'en vo from La Boheme, and Rachmaninoff's Dream, but also contribute to the unraveling theme of passion as cellist Misha Quint joins for Rachmaninoff's Do not sing for me, my love, a Russian aria with cello obbligato. A choir of 8 violoncellos led by Misha Quint will mark the grand finale of the evening, finishing this journey of passion with a Gershwin Cello Quartet, Villa-Lobos' Bachianas Brasileiras No.1, and a Mambo. Soprano Hein Jung will join the cellos for Villa-Lobos Bachianas No.5, a fiery aria in the Bachianas Brasileiras series, combining Brazilian folk and pop music and influences of J.S. Bach. 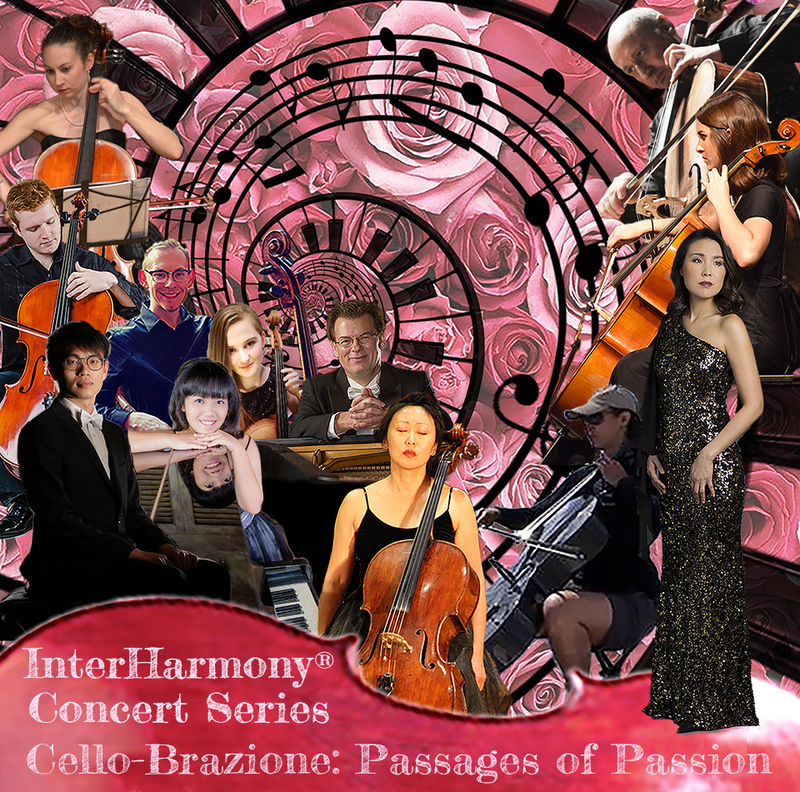 The InterHarmony Cello Ensemble features InterHarmony artists Ruth Boden, Chungsun Kim, Misha Quint and young artists Genevieve Batman, Brianna Cantrall, Francis Fay, Caitlin McConnell, and Gordon Shaw. DR. RUTH BODEN is an Associate Professor in the School of Music at Washington State University where she teaches cello, bass, music theory and coordinates the chamber music program. Dr. Boden holds a B.M. and M.M. in cello performance from the Cleveland Institute of Music, and a D.M.A. from the University of Alabama. Ruth is an active performer and has appeared as a guest artist with the Mid-Columbia Symphony, Washington Idaho Symphony, Coeur D’ Alene Symphony, and gave the premier performance of Philip Wharton’s Concerto for Violin and Cello. This year she is looking forward to guest performances in China and Taiwan. She has also been a member of numerous orchestras throughout the Southeast and Northwest, including the Pensacola Symphony, Huntsville Symphony, Tuscaloosa Symphony, Washington Idaho Symphony, and Spokane Symphony among others. Ruth served as the interim conductor for the Washington State University Symphony Orchestra from 2009-2011, interim Artistic Director and conductor for the Spokane Youth Symphony during the 2013-2014 season, and has served as guest conductor and clinician for numerous festivals throughout the Northwest. Ruth is a staunch supporter of new and contemporary music. She released her first solo CD Off the Cuff in July of 2014 which features eclectic contemporary music for solo cello. An avid hiker and lover of the outdoors, Ruth spends parts of her summers backpacking with her cello and performing new works commissioned for her project Music Outside Four Walls. Ruth lives in Pullman with her husband Dean Luethi and their cats La Manita and Crash. Acclaimed for her “superior vocal value” (Boston Globe), soprano HEIN JUNG has performed in major cities throughout the US and Korea. These venues include The Florida Orchestra, Opera Tampa, Tanglewood Music Festival, San Francisco Opera Merola Program, Milwaukee Symphony, Madison Opera, St. Petersburg Opera, Bel Canto Chorus, Tampa Oratorios Singers. Equally beloved on the concert stage, Jung has performed recitals on such prominent series as Sarasota Concert Association, Artist Series of Sarasota, University of Wisconsin Madison, University of Florida, University of Illinois at Urbana-Champaign, American Liszt Society Festival, Se-Jong Art Hall in Korea, Royal College of Musik in Sweden. In the 2017-2018 season, she will make a debut recital at the prestigious Kumho Recital Series, Soloist in Messiah with Bucheon Philharmonic and Choir in Korea, Interharmony International Music Festival in Italy, Rachmaninov concert in Damrau Concert Series, and Midday Concert Series at Northminster in US. Her recording of Songs of Franz Liszt, released by Centaur Records last year, was praised by American Record Guide: “Hein Jung has the perfect voice-terrific ease in her upper register and a silvery clear tone.” Praised as an advocate of contemporary music, Jung performed both the lead roles as Queen Juana in the world premiere of Rage d’amour, commissioned by Tanglewood, and as Princess Pocachin in The Red Silk Thread, commissioned by University of Florida and Curtis Phillips Center for the Performing Arts. Ms. Jung has won top prizes including the Metropolitan Opera National Council Audition (1st place in Wisconsin District and 2nd place in Upper Midwest Region), Irma Cooper International Competition (2nd place), Schubert Competition (2nd place). Currently, Jung is serving as Associate Professor of Voice at The University of Tampa, FL. A dynamic and versatile artist, cellist CHUNGSUN KIM has been widely recognized for performances in major music capitals in North and South America, Europe, and Asia. 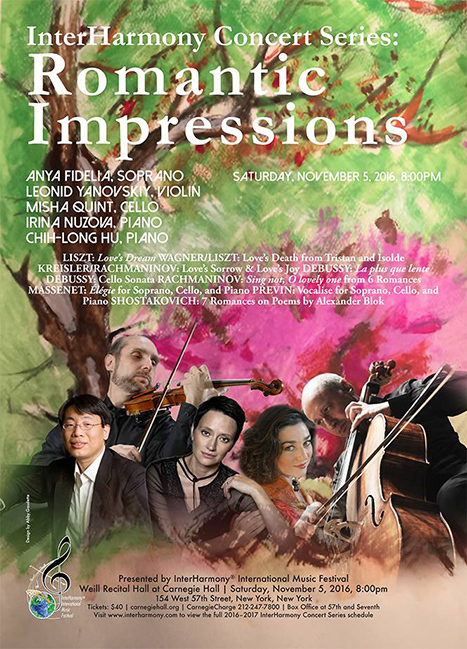 Her expressive playing and extraordinary musicianship have led her to perform at many different concerts and venues in the United States and abroad, including Alice Tully Hall, Sejong Concert Recital Hall (Korea), Araki Concert Hall (Japan), Weill Recital Hall at Carnegie Hall, Merkin Concert Hall, and Avery Fischer Hall at Lincoln Center. She has appeared as a soloist at Aspen Summer Music Festival, Arcady Music Festival, New International Music Festival (Korea), Laurentian Summer Music Festival, Schleswig-Holstein Music Festival (Germany), Beethoven Festival, and Summit Music Festival. Her new CD is scheduled to be released under the Hartshorn Classical in the fall of 2018. As an active chamber musician, Ms. Kim is a founding member of Amasi Trio, the Trio in Residence of Nyack College School of Music for the past twenty years. She is also a member of Trio di Buson, and the group released its first CD under the Guild label in 2014. As a dedicated teacher and cello pedagogue, she has taught in various settings, including Sarah Lawrence Music Festival, New International Music Festival, InterHarmony International Music Festival, and master classes at University of Florida, Ithaca College, and Ithaca Violoncello Institute. She has been a faculty member at Nyack College since 1994. Ms. Kim received her Bachelors, Masters, and Doctor of Musical Arts Degrees from The Juilliard School, where she was a scholarship student of Leonard Rose, Channing Robbins, and Harvey Shapiro. Pianist ROBERT PALMER'S career spans three continents, with solo, orchestral and chamber music appearances throughout the United States, Europe, and Asia. Following his critically-acclaimed Carnegie Hall debut, Palmer embarked upon a performing career that brought his artistry to many of the major concert halls of the United States and abroad. His performances have been broadcast on National Public Radio and public television in the United States as well as in China, Japan, Korea, Spain and Taiwan. Palmer has been presented in recital by Community Concerts, a subsidiary of Columbia Artists, and he continues to perform regularly throughout the United States, where he has been heard in virtually every major city including several recitals in both Carnegie Hall and Steinway Hall. He has made fifteen tours of Asia, with solo and concerto performances in the metropolitan centers of Osaka, Seoul, Shanghai, Taipei, and Tokyo, including such prestigious concert halls as the Grand Theatre in Shanghai, the Chiang-Kai Chek Concert Hall in Taipei, and the Seoul Arts Center in Korea. Palmer has also concertized frequently in England, France, Germany, Spain, and Russia. As a chamber musician, Robert Palmer has been heard in recital with musicians from the Paris Conservatoire, the Metropolitan Opera Company, the Montreal Symphony, the New York Philharmonic, and the St. Paul Chamber Orchestra Robert Palmer, Distinguished Professor of Piano at Ball State University, enjoys a highly successful teaching career and is widely sought after as an adjudicator, artist-in-residence, and master class clinician. His students have been prize-winners in numerous national and international competitions. Palmer has appeared at several international music festivals and he has adjudicated international piano competitions in Russia, England, and Thailand as well as national piano competitions in the US including the American Pianists Association Classical Fellowship awards. Pianist SHU-HAN SHEN was born in Taipei, Taiwan, and began studying the piano at age five. She studied piano with Professor Hsiao-Fen Chen and Professor Artemis Yen in Taiwan. Currently, Shu-Han is the recipient of the prestigious Richard Elliott Keyboard Scholarship, studying with Dr. Yu-Jane Yang, the Director of Keyboard Studies at Weber State University, pursuing the Bachelor’s of Music degree in Keyboard Performance. Shu-Han was the top prizewinner of many piano competitions in Taiwan before coming to the U.S., including the Taiwan Culture Cup Piano Competition, International Piano Competition of Vienna, Asia Pacific Cup Music Competition, and the Mandarin Daily News Piano Competition in Taiwan. Since coming to the USA, Shu-Han continues to receive recognitions for her excellent piano playing. Shu-Han was selected as the first place state winner of the 2016 Utah Music Teachers Association Piano Concerto Competition Senior Piano Division. She was chosen as a winner at the 2016 Weber State University Concerto Competition, and performed the Piano Concerto No. 1 by Franz Liszt with the WSU Symphony Orchestra in April 2016. Shu-Han was named one of the top prize state winners of the 2016 Music Teachers National Association (State of Utah) Steinway Young Artist Collegiate Piano Competition, and was also chosen as a finalist of the 2017 Coeur d’Alene Symphony National Concerto Competition Collegiate Piano Division. Shu-Han treasured the opportunities of performing and learning in piano master classes given by renowned pianists such as professor Hung-Kuan Chen of the Juilliard School and concert pianist Beatrice Long. A native of Hangzhou, China, pianist ZERU WANG is a second-year Master of Music Student in piano performance major studying with Professor Christopher Taylor at University of Wisconsin, Madison Mead Witter School of Music. He holds his Bachelor of Music degree at University of Missouri, Columbia under Dr. Peter Miyamoto. In addition to the 2015 MU Concerto Competition, he was also selected as winner of the 2015 MU Emerging Artist Competition. In both 2015 and 2016 he received Honorable Mention in the Music Teachers National Association(MTNA) Piano Competition and Missouri Music Teachers Association (MMTA) Collegiate Honors Auditions. He received scholarships at both University of Wisconsin and University of Missouri. As equally passionate as producing solo piano music, Mr. Wang enjoys performing collaborative and chamber music with both faculties and students at University of Missouri, InterHarmoy International Music Festival, Odyssey Summer Music Festivals and Bowdoin International Summer Music Festival. He has collaborated with prominent musicians such as Saeka Matsuyama, Jonathan Weber and Miho Zaitsu and many outstanding students from various institutions around the world. His chamber music teachers and coaches include Eva Szekely, Martha Fischer, Ani Schnarch, Misha Quint, Pei-Shan Lee and Tao Lin among others. From the age of three until he came to the United States, Mr. Wang studied with Professor Linlin Wang of the Shenyang Conservatory. He has performed in the master classes of Sergei Babayan, Alessio Bax, Julian Martin, Julio Elizalde, Gabriel Chodos, Corey Hamn and Mei-Hsuan Huang. He has studied with Peter Serkin, Yoon Hi Moon, Douglas Humphreys, Natalya Antonova, Bruce Brubaker, Sean Duggan, Sang Woo Kang and Daniela Mineva at summer festivals. As an accomplished young cellist at 14 years old, GENEVIEVE BATMAN hails from the remote Western Maryland mountainside town of Cumberland. There she plays in the Allegany Community Symphony Orchestra, Allegany High School Orchestra and in the Mountainside Baroque Academy. She has been studying under the tutelage of John Kaboff of the Kaboff Cello Studio in Vienna, VA since the age of 5, and has performed in his renowned cello choir, The Bow Lightlys. Genevieve placed first in the junior division at the Tennessee Cello Workshop hosted by University of Tennessee in 2018, where she played a piece by composed by Phillip Glass (2013) called “Orbit”; a modern nod to Bach’s Preludes I & II for unaccompanied cello. She also competed in the National Music Teacher’s Association solo competition in 2017 and received an honorable mention in the junior division for the State of Maryland. Genevieve has been fortunate to play alongside many distinguished professional cellists at the InterHarmony Music Festival in Acqui Terme, Italy and was the assistant principal cellist in the festival’s orchestra. She is honored to represent the talent this prestigious festival draws in her debut ensemble performance at Carnegie Hall. Cellist BRIANNA CANTRALL is a high school senior at Midlothian High School in Midlothian, Virginia and has been a cellist for 7 years. She is an avid musician in her community and has played in many county- and region-wide orchestras. In addition to school orchestras, she has played in the Loudoun Symphony Youth Orchestra and is currently a member of the Richmond Symphony Youth Orchestra. She studies under Jason McComb, the assistant principal cellist of the Richmond Symphony Orchestra. In 2018, Brianna attended the InterHarmony International Music Festival in Italy, where she performed in the symphony orchestra and two chamber ensembles. Cellist FRANCIS FAY is a music performance undergraduate at the Washington State University School of Music in Pullman, Washington. Francis attended Newport High School, and was a member of the school’s top orchestra, which has received awards from organizations such as ASTA, and had won the 2016 National Orchestra Cup in Avery Fisher Hall in New York City. Francis has been performing on the violoncello for twelve years and has attended numerous music festivals, including the 2015 ASTA National Orchestra Festival in Salt Lake City, Utah, and the InterHarmony International Music Festival in Acqui Terme, Italy. 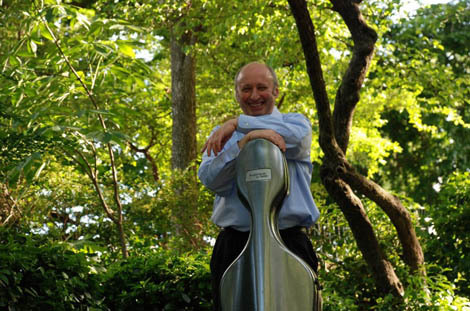 Francis has played with numerous regional orchestras such as the Northwest Mahler Festival, the Ensign Symphony, and the Northwest Symphony Orchestra, and is one of the co-principal cellists of the Washington State University Symphony Orchestra. Cellist CAITLIN QUINN MCCONNELL winner of the Pennsylvania, Regional, and National divisions of the National Federation of Music Clubs Collegiate Competitions, captured the Gladys W. Fisher Violoncello Award, the PFMC Award, the Harvey Gaul Award recognizing artistic potential, Agnes Fowler/Marie V. Thiesen Award and the Lawrence Foster Violoncello Award and was featured in the NFMC special publication. Ms. McConnell was also winner of an Assistanceship to Duquesne University for their Masters program under the tutelage of New York Soloist Misha Quint, the Tuesday Musical Club Scholarship Competition in May of 2008, Opus I Music Club Scholarship in April of 2008, and a prizewinner in the Music Teacher's National Association Young Artists Competition in 2007. Critics wrote that she "shone on the cello with wholehearted devotion and rich expression", in a performance of the Dvorak Cello Concerto in Sulzbach-Rosenberg, Germany in August of 2011. Ms. McConnell has performed extensively in the United States, Holland, Italy, Romania, and Germany, and at such prestigious festivals as the Soesterberg International Music Festival in Holland, and InterHarmony International Music Festival in The Berkshires, MA, San Francisco, CA, Hinterzarten, Germany, and Sulzbach-Rosenberg, Germany, where she was featured on German television, and recently at Carnegie Hall in New York City. She performed Tchaikvosky’s Souvenir de Florence with Nikolaj Znaider, Boris Kuschnir, Eugenia Petrova, Tomas Krejbich and Misha Quint in Germany in August 2017. Cellist GORDON H. SHAW is a sophomore at Washington State University in Pullman, Washington, where he is studying music composition, cello and guitar. He is a student of Dr. Ruth Boden and a member of the WSU Symphony Orchestra. Gordon grew up in Aberdeen, Washington, in remote Grays Harbor County on the Washington Coast. He has been playing cello since 5th Grade and has pursued music ever since. He was principal cellist of the Aberdeen High School Orchestra before WSU and is the first recipient of the Marie Akerlund Orchestra Award. Along with cello and guitar, he also played upright bass in the Aberdeen High School Jazz Band. In addition, his interest and involvement in musical theatre (Has performed in eight musicals, including leading roles in ‘Oklahoma!’ and ‘The Sound of Music’) led him to study and receive private instruction for voice at Grays Harbor College. During the summer he will continue to perform with the Grays Harbor Symphony in Aberdeen. This year, he was awarded a summer study grant by the WSU College of Arts and Sciences and participated in the InterHarmony International Music Festival at Acqui Terme, Italy in July. Ever since this experience he has been studying and composing pieces in the Baroque style. 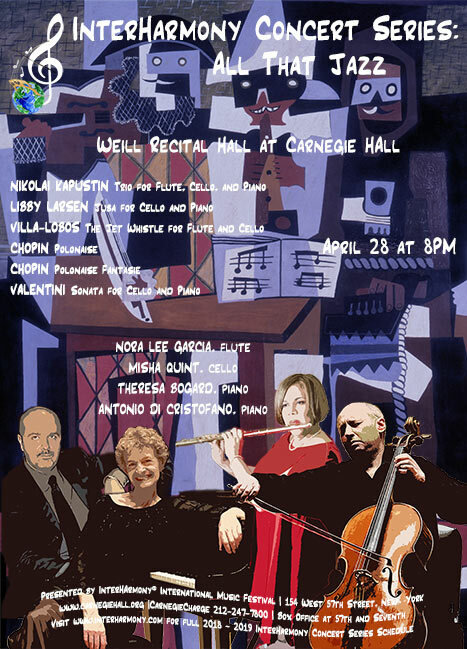 Tickets are $40, and can be purchased by calling CarnegieCharge at 212- 247-7800; at the Carnegie Hall box office located at West 57th and Seventh Avenue or online at www.carnegiehall.org. 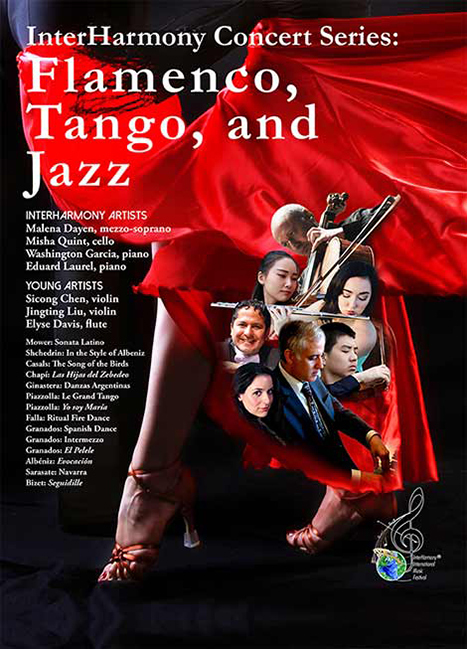 InterHarmony International Music Festival has been taking place in European and American cities for the past 15 summers, transports the excitement of its European music festivals to New York City for a series of 3 concerts for the sixth season. 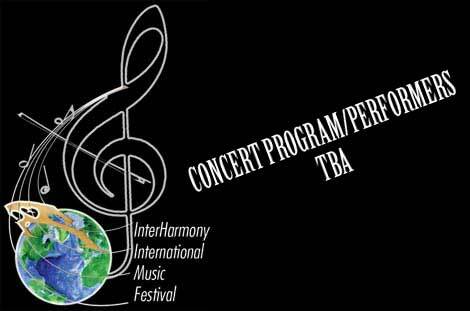 Come see our concerts in Italy and Germany as well this summer at the InterHarmony International Music Festival! Friend InterHarmony International Music Festival for latest updates.